On this date in 1573, Gilles Garnier was burned at the stake as a lycanthrope. The “Werewolf of Dole” was a scavenging hermit resident on the outskirts of that Burgundian town when a little girl was strangled and partially eaten in October of 1572. Townsfolk feared a maneating wolf but a subsequent pattern of attacks would point at something even more frightful. As kitsch as it becomes for us in modernity, it is not difficult to discern in the werewolf legend the shadow of a truly terrifying era when predatory wolves and predatory men alike prowled the dangerous byways in Europe, especially France. And a sure way to conflate the two was through a figure like Garnier (English Wikipedia entry | French), who, in a starving winter, monstrously ate the flesh of his victims. He would later confess — we can only guess through what combination of disordered mind and torturer’s suggestion — that as he foraged one day, wracked by hunger, a phantom appeared to him and offered him an ointment that would confer the lifesaving hunting prowess of the wolf. Like any opportunistic carnivore, the loup-garou Garnier knew enough to prey upon the weakest. 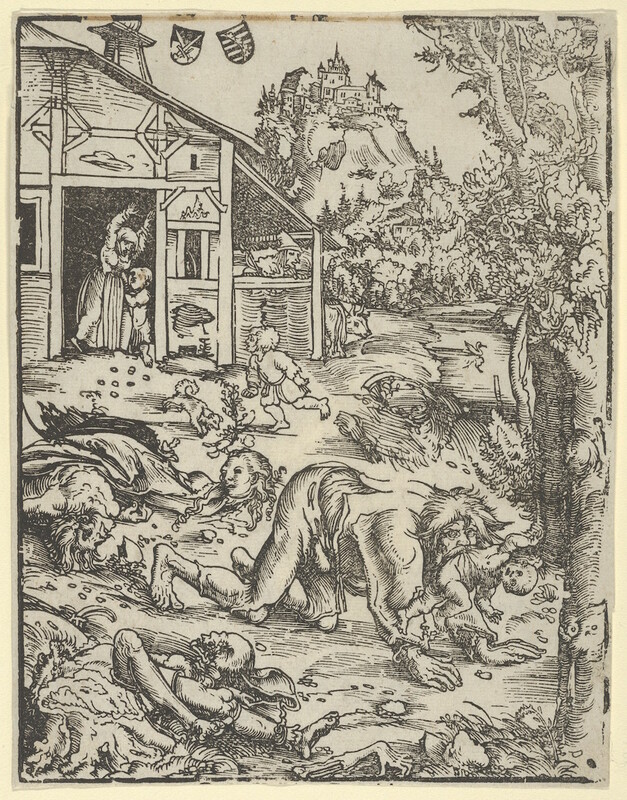 Shortly after slaying that first victim, Garnier grabbed another little girl and was in the process of a bestial hands-and-teeth attack when some villagers came upon the scene. Garnier fled, but at least some of these accidental witnesses were convinced that they had seen a wolf attack — for what man tears into his still-dying quarry with his bare teeth? Then again, as observed by Sabine Baring-Gould* — whose The Book of Were-Wolves makes for a goosefleshing Halloween read — there would even post-Garnier in 1573 be an edict promulgated against what Parlement suspected was continuing werewolfery in the vicinity, directing all and sundry “to assemble with pikes, halberts, arquebuses, and sticks, to chase and to pursue the said were-wolf in every place where they may find or seize him; to tie and to kill, without incurring any pains or penalties.” Lycanthropy is stirring deep within this society, authorities, onlookers and offender(s?) all suggestible to one another. Garnier killed a little boy later that same November, perhaps his most gruesome as he not only cannibalized the fresh corpse but tore off the child’s leg to save for later. His trial, which was for all its fantastic content notably a secular one, was a monument to the fear that must have gripped Dole while children vanished only to turn up as carrion: some fifty witnesses were summoned, many to make connections between Gilles Garnier and canis lupus that one would strain to credit as speculative but were probably quite sincere. Everyone knew there was a werewolf, and then everyone knew Gilles Garnier was that werewolf. Like the French peasantry, posterity has seen in Garnier what it hopes or expects to see. Do we witness the grim and commonplace effects of torture upon a bystander being scapegoated for the natural incursions of wolves? The predations of a “normal” serial killer refracted through his society’s superstitions? A mentally ill man truly convinced (as with the wendigo psychosis) of his own beastliness? An entirely false confession reflecting Garnier’s own complicity in the same evolving myth that captivated his neighbors? Or might we allow with Montague Summers the genuine historicity of the monster? 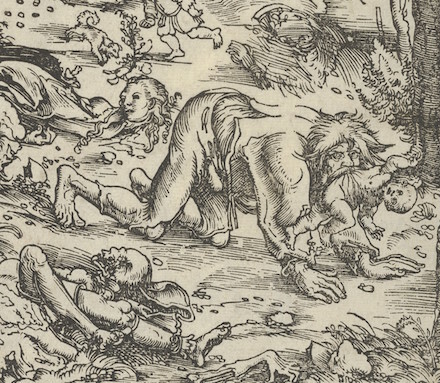 As Nabuchodonosor was so punished by God, so Heaven may also well have permitted Gilles Garnier and the sorcerers of Savoy owing to their vile appetites and their lust for human flesh to have become wolves, losing human form. If you prefer your rending human flesh in podcast form, Stuff You Missed In History Class covered this story in a (graphic) Halloween episode. * An occasional Executed Today guest blogger, through the magic of public domain. On Sept 18, 1589, a magistrate and deputy governor in Trier, a city embroiled in a witch-burning campaign, was himself delivered that fate. But the storm that was to rob him of fortune, fame, and life was already brewing all along the horizon. The witch-trials, which, during the earlier part of the century, had appeared only sporadically, were settling here and there into organized persecutions. In the neighboring Lorraine, the terrible Nicolas Remy was already exercising that judgeship, as the fruit of whose activity he could boast a decade later of the condemnation of nine hundred witches within fifteen years; and just across the nearer frontier of Luxemburg, now in Spanish hands, the fires were also blazing. Nay, the persection had already, in 1572, invaded the Electorate itself. In six years, the diocese of Trier oversaw the execution of 368 witches, many of whom confessed only under torture. The anti-witchcraft campaign was so expansive that some towns were left with few if any women. The hysteria was widely reviled by the academics of the time, including both Flade and Cornelius Loos. Loos was so disturbed by the events occurring around him that he wrote a book in objection; before it could gain distribution, however, Loos was arrested and jailed. It was four years before he was released, only after recanting his entire treatise and acknowledging the authority of the Pope. Flade (German Wikipedia link) was not as lucky. As judge, he was too light with suspected witches and allowed many to go free or get off with light sentences. Worst of all, he let the unsettled Reformation continue without his intervention on behalf of the church. His “trial” was brutal*, with an extracted confession from five heinous torture sessions serving as evidence against him. As high-ranking as Flade was, though, he was executed rather mutedly in Treves. Not without reason, Burr suspects the motive was entirely political on the part of Archbishop Johann von Schöneburg. Von Schöneburg immediately stepped up his campaign to ensure his dominion, moving to larger mass executions and damning the populace to a generation of loss — except the executioner, of course, who was paid handsomely for the deed. The persecutions were spurred on by both similar events elsewhere in the world and the writings of those directly involved. France, and, of course, Spain both featured notable witchcraft courts. One bishop under Von Schoeneburg, Peter Binsfield, was tasked with scribing works to defend the practice, which he dutifully discharged in 1589 and 1591; these were followed shortly by Jesuit Peter Thyraeus** (1594) and the aforementioned Nicholas Remy (1595). By that time, however, the furor in Trier had, in more ways than one, burned itself out: by 1593, with too few people to tend the land and sustain the towns, the area around Trier had become an economic crater, and the persecutors put a reluctant end to the madness. Badly damaged page from Flade’s original trial transcription, courtesy of the Cornell University Library’s Witchcraft Collection. * One of the founders of Cornell University, A.D. White, joined forces with Burr to acquire the one known copy for that university’s library in 1883. Burr intended to transcribe the text but apparently never completed the job, instead delivering several talks and writing an tract on the subject that includes extensive footnotes. ** Thyraeus also wrote one of the age’s definitive considerations of lycanthropy, shapeshifting and werewolfism — another demonic manifestation simultaneously afoot in Germany.